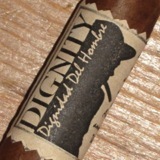 Costa Rica-based Dignity Cigars introduced its Dignidad del Hombre brand at the 2013 industry trade show. I don’t actually remember where I got this cigar (maybe it was a sample from that show) but I’ve had it for the better part of a year. The Torpedo (6 x 52) features a cool-looking band with a silhouette of one of the workers in the factory where it is made. (Careful though; the band was a real pain to remove without damaging the cigar.) Once lit, I found a combination of oak, cream, and warm tobacco. It’s medium-bodied and, except for a notably unstable ash, construction was fine. I applaud Dignity for trying something different by making Costa Rican puros using pesticide-free organically-grown tobacco. While this isn’t a cigar I’ll return to often, it makes me want to try out Dignity’s other offerings.